Today we have quite an interesting coin ZCLBTC that I have been trading myself quite some times. Just a little story about it first, ZCLBTC had a 9900% gain last year before the BitcoinPrivate Fork, went from $2 to $220 and then back to $5. Now, a few months back there were rumours that ZClassic is forking again, so people started FOMO-ing into it. Here comes the funny part, ZClassics' Twitter is controlled by BitcoinPrivate people who posted at the price of $40 that they do not know anything about a fork and any rumors are fake, this leads to a 50% crash within a few days. 3 days later BitcoinAnonymous presented the team publicly. Unfortunately, the price did not go up again since then but it is not crashing completely. #CryptoTwitter The ANON Team is legit and forking Bitcoin and ZClassic on September 1:1 with a possibility to get a master node with just 100 ANON. So if you want a master node, get yourself 100 ZCL and leave it there until the fork, I think CCA also already mentioned this once before. Alright, now back into the short time chart,, keeping it as simple as possible and making it easy to learn. 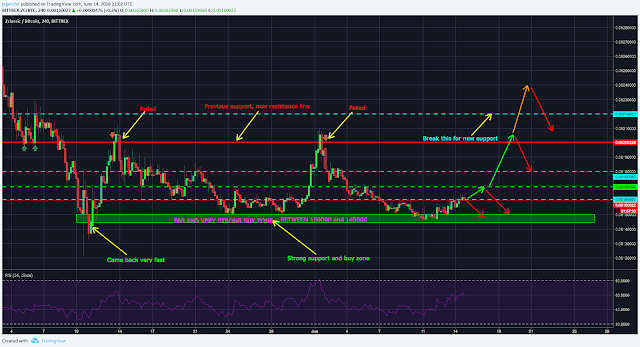 The first thing that is important to look at is the big and strong buy zone between 150000 and 145000 satoshi. Here the chart bounces off very clearly and does not cross it below. So whenever you see ZCLBTC in this region and there are no negative news or other external influences, it is a good point to buy. Next are the two blue dotted and the green dotted lines. These are basically small support and resistance lines in the Channel between 145000 and 200000. The first blue line is there to confirm an upward movement. Then followed by the green line, which when is broken, will almost guarantee a push to the second blue line. Whereas, when the green line is not broken, it will most likely go down to the buy zone. SO, breaking the strong green and the weak second blue line, the chart goes up to the 200000 line and has to decide, what will happen next. You have to know that the 200000 line was previously a strong support line but now has turned into a strong resistance line. 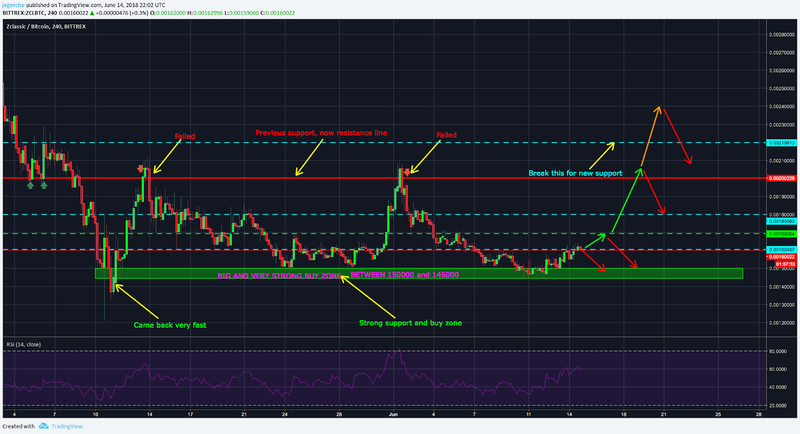 So, after crossing it already twice, ZCLBTC has failed to continue the push and has retraced back to the dotted lines and finally the buy zone. The thing with the support and resistance lines is, that you will never hit it unlimited times. It is like hitting a wall with sledge hammer and if you hit it hard (big volume) and quite some times (here already 2, mostly it breaks by the 3rd or 4th time), it will break (all orders sitting there will be filled) and allow the chart to test the next resistance. Basically after hitting 200000 3 times with big volume, we should see ZCLBTC rising above it and trying out the next resistance at 220000. So, after hitting 220000 we would see the 200000 line turn into a support again. on which we should not bounce a lot off because then the buy order will get filled and we will see the 150000 again. So again, resistance represents many sell orders and hitting these will have less and less sell orders the next time. Support represents buy orders sitting at that level and bouncing off support too many times will cause less buy orders at that level, what raises the chance of going to the next level of support (with a lot of buy orders). I recommend checking the order book on the exchanges you are trading. These order books really show you great levels of support and resistance as well as where you should put your buy or sell order (before the big amount, so yours gets filled). As little side note, ZCL-BTC is a very nice example of how much cryptos love round numbers. Just take a look a look at all of these lines and keep it in mind for the other coins, that you take a look at.